Whether it’s because you’re a keen runner in your free time or your job requires you to stand all day, Plantar Fasciitis can be particularly frustrating when wearing dress shoes. The stabbing pain under your feet can be overwhelming and leave you completely incapacitated by the evening. Found the right ones for you? Use the links above to jump ahead or scroll down to keep reading. We’ll also take a brief look at the features dress shoes can offer to generally improve your condition. Just want to grab the dress shoe style that suits you most? Use the Quick Buy Guide below to be redirected to the retailers. Otherwise, just scroll down to discover their details. What Are The Best Men’s Dress Shoes For Plantar Fasciitis? Inspired by athletic shoes, Wolf & Shepherd have devised some of the most premium and comfortable dress shoes that we’ve yet to see. Expect features such as supportive midsoles, an EVA foam heel, Phoenix TECH outsole as well as a proprietary memory foam footbed. Timelessly stylish and elegant, these are the ideal shoes for just about any formal occasion including the office. They’ll look great in business professional attire just as much as if you were to wear them at a black tie event. Whilst you could also opt for a honey tan or maple brown leather Oxford, we find that the classic black is much more practical. If these are your first Oxfords, we’d recommend black above the others as you’ll be able to use them for more formal events. A discreet yet stylish othortic shoe, these well-designed monk strap shoes leave your entourage none-the-wiser. However, you can still benefit from a removable footbed and open-cell PU foam insole for true comfort. A versatile dress shoe style, you can pair these with business casual attire as well as more formal outfits. For instance, they’ll look great with jeans but you could even slip them on whilst wearing a classic suit. We’d recommend the black full-grain leather if you have more formal needs. However, the brown is a versatile choice that would fare between if you tend to dress up or down depending on the day. Rockport is a reputable brand that also offers orthopaedic shoes that aren’t too conspicuous or clinical. Both subtle and stylish, you’ll be able to enjoy the comfort of an EVA footbed, which provides the wearer both stability and comfort. Great for both business professional and cocktail attire wear, these are classic brogues that feature all the perfing and pinking that you’d expect. 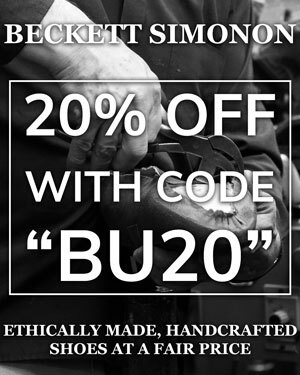 They’ll even add a little stylish flair, which is quite surprising for orthotic shoes! Unfortunately, these brogues are only available in black, which is a shame. After all, brown is a more traditional colour for brogues. 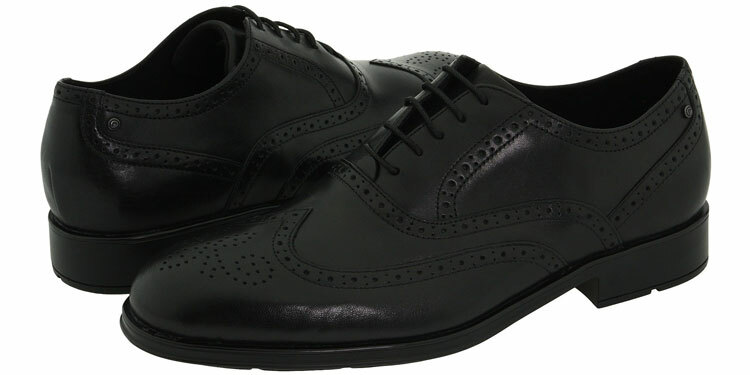 Nevertheless, even in black, these brogues look very stylish indeed! Another subtle orthotic shoe that’s designed for more severe disorders, these are worth trying if you have a bad case of Plantar Fasciitis. You’ll benefit from a greater level of protection as well as cushion for comfort. Derby shoes are a relatively versatile style of footwear that can be worn quite casually but formally too. However, they can’t be worn too formally as the open-throat lacing system style is considered too bulky for evening wear. 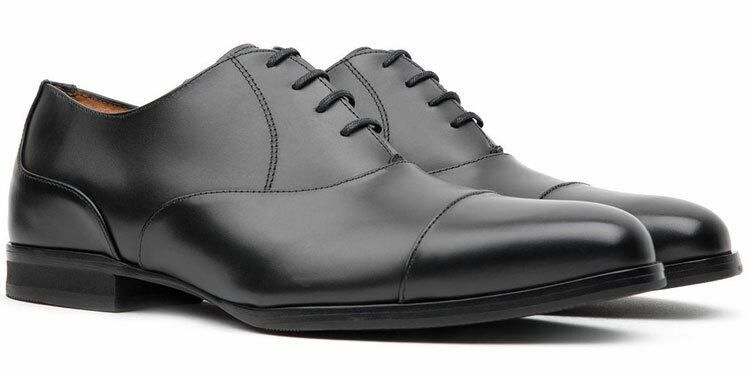 If you’re just looking for comfortable dress shoes for work, we’d recommend the black leather. 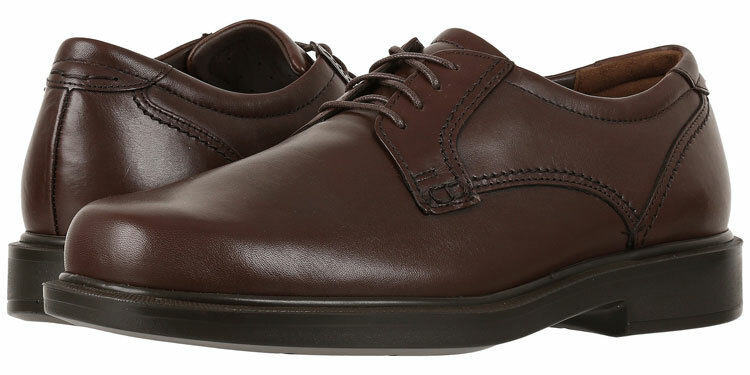 However, if you want a more versatile shoe for business casual wear as well, the brown is a solid choice. Thanks to an EVA heel, stress is reduced on the heel. Meanwhile, the memory foam footbed takes pressure off the plantar and cups the contours of the feet. Finally, the lightweight construction reduces overall strain. We love how the Breakaway boot is very versatile footwear and easy to wear for a number of occasions. Depending on its colour, you can wear it for business professional wear as well as more casual usage. 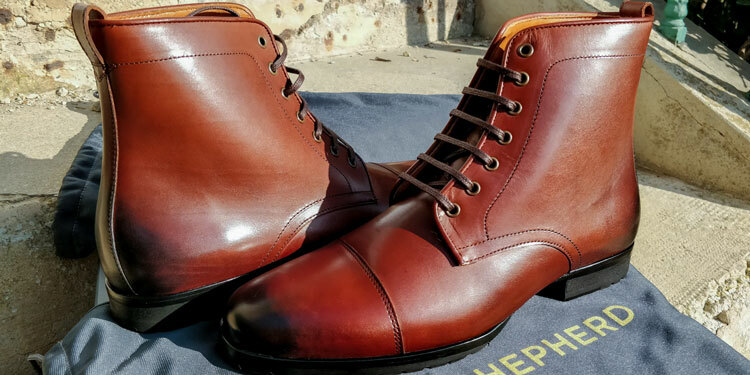 While we prefer the versatility of the reddish cognac brown, you can also choose these boots in a dressy black Onyx or a casual honey tan. 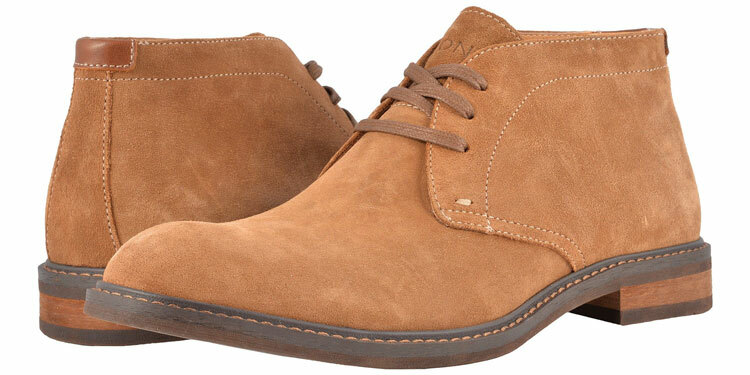 Another classic but less formal style of shoe is the Chukka. Whilst it’s not strictly a dress shoe, these are formidable shoes for people suffering from Plantar Fasciitis. Made by Vionic, they feature a removable EVA footbed that was especially designed by podiatrists. Especially appropriate for slightly more casual wear, they’re great all-year boots with a very stylish finish. In fact, they’re indistinguishable from regular chukka boots. These looks great in business casual attire but fit right in with jeans and a T-shirt. There are both tan and black options, which are each made from water-resistant suede. We find that the black is a touch too formal whilst the tan is a very versatile colour choice for dressing up and down. 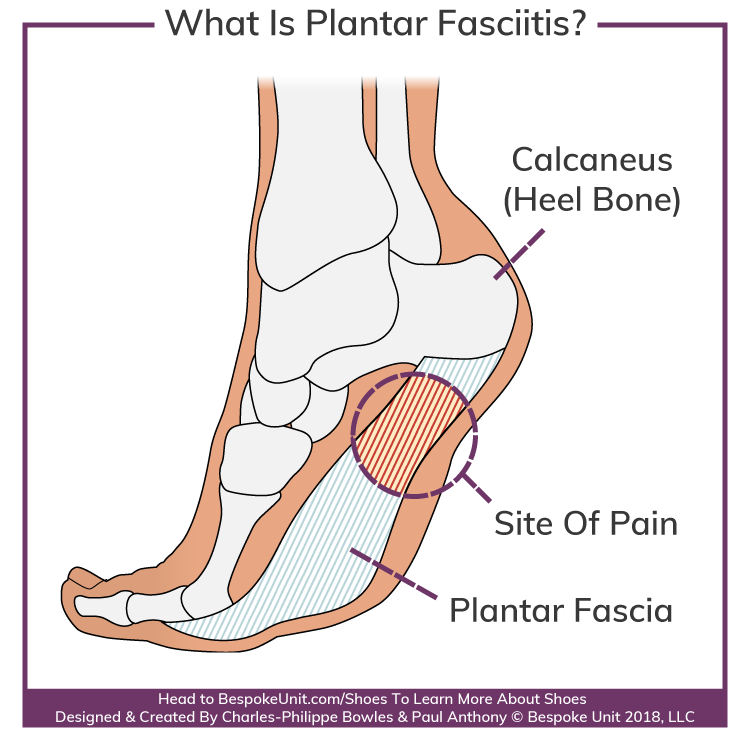 Although you may have already read about it on our specific Plantar Fasciitis shoe guide, it’s a well-known disorder that is believed to affect nearly a third of all American adults between the ages of 40 and 60. Whilst sports enthusiasts are often the most prone to the condition due to intense exercise, it can also affect pregnant women and people with obesity issues. Furthermore, standing all day can be a contributing factor, which many people have to do for work. Whatever the reason, the condition is brought along by prolonged or repetitive strain that’s applied to the Plantar. This is a band of connective tissue on the underside of the foot that acts like a shock absorber when standing, running or walking. It was originally presumed that Plantar Fasciitis was an inflammation until it became apparent that this was merely a symptom. In fact, the repeated pressure and strain applied to the plantar causes micro-trauma and fissures along the tissue. The result is a chronic stabbing pain on the underside for the foot that can put you out of action for months. However, outside of other therapies and treatments, there are orthotic shoes that can help alleviate the condition. Firstly, bear in mind that shoes for Plantar Fasciitis work best as a preventative measure rather than a cure. If you are prone to the condition, undertake activities which may cause it or feel pain in your feet on occasion, it’s best to invest in good shoes to provide the necessary protection. However, orthotic shoes for Plantar Fasciitis can indeed contribute to your therapy. They work by taking pressure off the Plantar itself by providing cushion and support elsewhere. In the end, the shoes function as a secondary Plantar so the tissue’s tears can begin to heal. Lightweight Materials: Probably one of the most efficient ways to take pressure off the plantar is by lessening their load. Lightweight dress shoes are becoming a more popular option and will grant you the most fundamental relief. Arch Support: Supporting the arches will also reduce the strain taken by the arches. However, be sure to opt for arch support that corresponds to your feet’s contours. Too much or too little can worsen the pain. Cushioning: A characteristic that used to be overlooked in dress shoes, you’ll start to see it more and more. However, opting for shoes with superior cushioning will provide extra comfort and support. Improved Stability: Brought by wider and heel counters, this prevents your feet pronating and ensures that the plantar doesn’t have to compensate for an incorrect stride. Ethylene Vinyl Acetate: EVA is a popular shock-absorbing material that is usually find in either the midsole, insole or even the heel. Removable Footbeds: Often made from EVA or leather-lined, removable footbeds are ideal. This way, they can be replaced for more customised ones that fit the contours of your feet, which will provide better support. Polyurethane: Like EVA, PU is another common shock-absorbing material used for making comfortable shoes. More hard wearing, it tends to be used an alternative to rubber outsoles. However, sometimes it can be used in a foam form for either the insole or the heel. Rubber Outsoles: Whilst this depends on the quality of the rubber, more natural variants will provide a very cosy bounce. Some will find both the traction and comfort better than the more traditional leather outsoles and stacked heels. Reviewed by Alfred W., on 30th November . 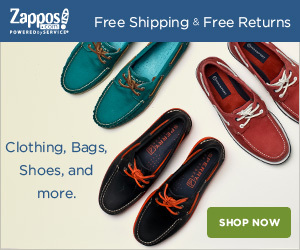 "No garish orthotic shoes. Finally, I'm not wearing ugly orthopaedic shoes because of my sensitive Plantar."